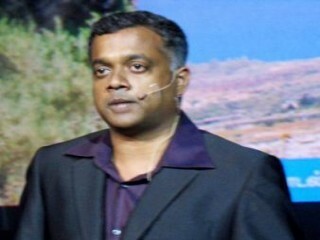 Gautham Vasudev Menon is an Indian film director and producer. Mainly working in Tamil cinema, he has also directed Hindi and Telugu films which are remakes of his Tamil films. Gautham Menon was a student of mechanical engineering at Mookambigai College of Engineering in the batch of 1993, and his time there inspired him to make his lead characters of Minnale and Vaaranam Aayiram, students of the same course. He claims to have been inspired by films such as Dead Poet's Society and Nayagan and expressed his desire to his parents to change career path and become a filmmaker and consequently wrote his first film at his college hostel. His mother insisted he became an ad film maker by shooting various commercials and took an apprenticeship under filmmaker Rajiv Menon. He went on to work as an assistant director for Minsaara Kanavu in 1997, in which he also appeared in a cameo role. Gautham Menon launched a Tamil romantic film O Lala in 2000 with the project eventually changing producers and title into Minnale with Madhavan, who was at the beginning of his career, being signed on to portray the lead role. About the making of the film, Menon revealed that he found it difficult as the team was new to the industry with only the editor of the film, Suresh Urs, being a prominent technician in the industry. Menon had come under further pressure when Madhavan had insisted that Menon narrated the story to his mentor, Mani Ratnam, to identify if the film was a positive career move after the success of his Alaipayuthey. Despite initial reservations, Menon did so and Ratnam was unimpressed; however Menon has cited that he thought that Madhavan "felt sorry" and later agreed to continue with the project. The film also featured Abbas and newcomer Reemma Sen in significant roles, whilst Menon introduced Harris Jayaraj as music composer with the film. The film was advertised as a Valentine's Day release in 2001 and told the tale of a young man who falls in love with the girl engaged to his ex-college rival and how he manages to get married to her. Upon release it went on to become a large success commercially and won positive reviews from critics with claims that the film had a lot of " lot of verve and vigour" and that it was "technically excellent". The success of the film led to producer Vashu Bhagnani signing him on to direct the Hindi language remake of the film, Rehna Hai Tere Dil Mein, which also featured Madhavan with Diya Mirza and Saif Ali Khan added to the film. Menon was initially apprehensive but said it took "half an hour" to agree and against his intentions, the producer opted against retaining the technical crew of the original.He changed a few elements, deleted certain scenes and added some more for the version. However in comparison, the film gained poor reviews with a critic citing that the "the presentation is not absorbing" though stating that he " handled certain sequences with aplomb"; the film subsequently went on to become a below average grosser at the box office. The failure of the film left him disappointed, with Menon claiming in hindsight that the film lacked the simplicity of the original with the producer's intervention affecting proceedings. In 2011, the producer of the film approached him to remake the film with the producer's son Jackky Bhagnani in the lead role, but Menon was uninterested with the offer. Menon returned in 2003 by directing the realistic police thriller Kaakha Kaakha featuring Suriya, Jyothika and Jeevan in the lead roles. The film portrayed the personal life of a police officer and how his life is affected by gangsters, showing a different perspective of police in comparison to other Tamil films of the time. [ Menon revealed that he was inspired to make the film after reading of articles on how encounter specialists shoot gangsters and how their families get threatening calls in return, and initially approached Madhavan, Ajith Kumar and then Vikram for the role without success, with all three actors citing that they did not want to play a police officer. The lead actress Jyothika asked Menon to consider Suriya for the role, and he was subsequently selected after Menon saw his portrayal in Nandha. He did a rehearsal of the script with the actors, a costume trial with Jyothika and then enrolled Suriya in a commando training school before beginning production, which he described as a "very planned shoot". The film consequently opened to very positive reviews from critics on the way to becoming another success for Menon, with critics labeling it as a "career high film". Furthermore, the film was described as for "action lovers who believe in logical storylines and deft treatment" with Menon being praised for his linear narrative screenplay. Gautham Menon subsequently remade the film in the Telugu language for producer Venkata Raju and went on to claimi that the new version was better than the previous version and that his new lead actor Venkatesh was more convincing that Surya in the role. The film also featured actress Asin and Saleem Baig in prominent roles and went on to earn commercial and critical acclaim with reviewers citing that "film redeems itself due to the technical excellence and masterful craft of Gautham", drawing comparisons of Menon with noted film makers Mani Ratnam and Ram Gopal Varma. In July 2004, Menon also agreed terms to direct and produce another version of Kaakha Kaakha in Hindi with Sunny Deol in the lead role and revealed that the script was written five years ago with Deol in mind, but the film eventually failed to take off. Producer Vipul Shah approached him to direct the Hindi version of the film in 2010 as Force with John Abraham and Genelia D'Souza, and Menon initially agreed before pulling out again. Menon and the original producer, Dhanu, also floated an idea of an English version with a Chechnyan backdrop, though talks with a potential collaboration with Ashok Amritraj collapsed. Gautham Menon was then signed on to direct a venture starring Kamal Haasan and produced by Kaja Mohideen, and initially suggested a one-line story which went on to become Pachaikili Muthucharam for the collaboration. Kamal Haasan wanted a different story and thus the investigative thriller film, Vettaiyadu Villaiyadu, was written with Jyothika, Kamalinee Mukerji, Prakash Raj, Daniel Balaji and Saleem Baig added to the cast. The film told another episode from a police officer's life, with an Indian cop moved to America to investigate the case of psychotic serial killers before returning to pursue the chase in India. During the shooting, the unit ran into problems after the producer had attempted suicide and as a result, Kamal Haasan wanted to quit the project. Menon subsequently convinced him to stay on as they had taken advance payments. He has since revealed that unlike Kamal Haasan's other films, he did not take particular control of the script or production of the film. The film however had gone through change from the original script with less emphasis on the antagonists than Menon had hoped and he also revealed that scenes for songs were forced him and shot without him. The film released in August 2006 and went on to become his third successive hit film in Tamil and once again, he won rave reviews for his direction. Menon later expressed interest in remaking the film in Hindi with Amitabh Bachchan in the lead role without the love angle, though the project fell through after discussions. He has stated his intent on making a trilogy of police episode films, with a possible third featuring Vikram in the lead role. His next project, Pachaikili Muthucharam, based on the novel Derailed by James Siegel, featured Sarath Kumar and Jyothika in the lead roles and was released in February 2007. Initially the lead role was offered to Kamal Haasan who passed the opportunity, while actors Cheran and Madhavan declined citing date and image problems respectively. Menon met Sarath Kumar at an event where he cited he was looking to change his 'action' image and Menon subsequently cast him in the lead role. During production, the film ran into further casting trouble with Simran dropping out her assigned role and was replaced by Shobana after another actress, Tabu, also rejected the role. Shobana was also duly replaced by a newcomer, Andrea Jeremiah to portray the character of Kalyani in the film. The film was under production for over a year and coincided with the making of his previous film which was largely delayed. The film initially opened to positive reviews with a critic citing that Menon is "growing with each passing film. His style is distinctive, his vision clear, his team rallies around him and he manages to pull it off each time he attempts". However the film became a financial failure for the producer, Venu Ravichandran and in regard to the failure of the film, Menon went on to claim that Sarath Kumar was "wrong for the film" and that he tweaked the story to fit his image; he also claimed that his father's ailing health and consequent death a week before the release had left him mentally affected. His next release, Vaaranam Aayiram, saw him re-collaborate with Suriya, who played dual roles in the film. The film illustrates the theme of how a father often came across in his son's life as a hero and inspiration, and Menon dedicated the film to his late father who had died in 2007. The pre-production of the film, then titled Chennaiyil Oru Mazhaikaalam began in 2003, with Menon planning his a romantic film with Suriya as a follow up to their successful previous collaboration, Kaakha Kaakha. Abhirami was signed and then dropped due to her height before a relatively new actress at the time Asin was selected to make her debut in Tamil films with the project. The first schedule of the film began in January 2004 in Visakhapatanam and consequently romantic scenes with Suriya and Asin were shot for ten days and then a photo shoot with the pair. The film was subsequently stalled and was eventually relaunched with a new cast including Divya Spandana, Simran and Sameera Reddy in 2006 with Oscar Ravichandran stepping in as producer, who opted for a change of title. Menon has described the film as "autobiographical and a very personal story and if people didnt know, that 70% of this [the film] is from my life".The film's production process became noted for the strain and the hard work that Suriya had gone through to portray the different roles with production taking close to two years. The film released to a positive response, with critics heaping praise on Suriya's performance while claiming that the film was "just a feather in Gautam's hat" and that it was "hardly a classic". The film was made at a budget of 15 crore rupees and became a commercial success, bringing in almost 22 crore rupees worldwide. It went on to become Menon's most appreciated work till date winning five Filmfare Awards, nine Vijay Awards and the National Film Award for Best Feature Film in Tamil for 2008 amongst other accolades. In 2010, Menon made a return to romantic genre after nine years with the Tamil romantic film Vinnaithaandi Varuvaayaa, starring Silambarasan and Trisha Krishnan. The film explored the complicated relationship between a Hindu Tamil assistant director, Karthik, and a Syrian Christian Malayali girl, Jessie and their resultant emotional conflicts. The film featured music by A. R. Rahman in his first collaboration with Menon whilst cinematographer Manoj Paramahamsa was also selected to be a part of the technical crew. Menon cited that he was "a week away from starting the film with a newcomer" before his producer insisted they looked at Silambarasan, with Menon revealing that he was unimpressed with the actor's previous work. The film was in production for close to a year and throughout the opening week of filming, promotional posters from classic Indian romantic films were released featuring the lead pair. Prior to release, the film became the first Tamil project to have a music soundtrack premiere outside of India, with a successful launch at the BAFTA in London. Upon release, the film achieved positive reviews, with several critics giving the film "classic" status, whilst also become a commercially successful venture. Reviewers praised Menon citing that "credit for their perfect portrayal, of course, goes to Gautam Menon. This is one director who's got the pulse of today's urban youth perfectly" and that "crafted a movie that will stay in our hearts for a long, long time." The film was simultaneously released with a Telugu version, titled Ye Maaya Chesave featuring a fresh cast of Naga Chaitanya and debutante Samantha in the lead roles. Like the Tamil version, the film won critical acclaim and being given "classic" status from critics. Both films also went on to become large commercial successes, and the films have received awards from award committees. Menon had also made progress over the previous two years directing the psychological thriller Nadunisi Naaygal featuring his assistant and debutant Veera Bahu and Sameera Reddy in the lead roles. Menon claimed that the film was inspired by a true event from the USA, while also claiming that a novel also helped form the story of the film. During the making, he explicitly revealed that the film was for "the multiplex audience" and would face a limited release, citing that "it will not cater to all sections of the audience". He promoted the film by presenting a chat show dubbed as Koffee with Gautham where he intereviewed Bharathiraja and Silambarasan, both of whom had previously worked in such psychological thriller films with Sigappu Rojakkal and Manmadhan. The film, which was his first home production under Photon Kathaas and did not have a background score, told the story of a victim of child abuse and the havoc he causes to women, narrating the events of a particular day. The film opened to mixed reviews with one critic citing it as "above average" but warning that "dont go expecting a typical Gautham romantic film" and that it "is definitely not for the family audiences", while criticizing that "there are too many loopholes in the story, raising doubts about logic".In contrast another critic dubbed it as an "unimpressive show by star director Menon, as it is neither convincing nor appealing, despite having some engrossing moments". Since July 2010, Menon has been involved in pre-production work on the Hindi language remake of his film, Vinnaithaandi Varuvaayaa, with delays still forcing the film to postpone its first schedule. Workshops and rehearsals for the film were held in early 2011 with Prateik Babbar and Amy Jackson playing the lead roles in the version. Furthermore, he has expressed that he is likely to restart his long-delayed project Chennaiyil Oru Mazhaikaalam with reports emerging that he may begin the film again with a fresh cast. Another film, a home production Thuppariyum Anand has also been announced with Menon stating that he has completed the script and handed copies to Aamir Khan and Kamal Haasan, in the hope that either will do the film. His next is a Tamil film with Jeeva and Samantha in the lead roles. Meanwhile Menon has gone on to confirm that he will direct a television weekly serial featuring Parthiban in the lead role as a police officer in 2011. View the full website biography of Gautham Vasudev Menon.